The rapid development of computing power and efficient Markov Chain Monte Carlo (MCMC) simulation algorithms have revolutionized Bayesian statistics, making it a highly practical inference method in applied work. However, MCMC algorithms tend to be computationally demanding, and are particularly slow for large datasets. Data subsampling has recently been suggested as a way to make MCMC methods scalable on massively large data, utilizing efficient sampling schemes and estimators from the survey sampling literature. These developments tend to be unknown by many survey statisticians who traditionally work with non-Bayesian methods, and rarely use MCMC. Our article explains the idea of data subsampling in MCMC by reviewing one strand of work, Subsampling MCMC, a so called Pseudo-Marginal MCMC approach to speeding up MCMC through data subsampling. The review is written for a survey statistician without previous knowledge of MCMC methods since our aim is to motivate survey sampling experts to contribute to the growing Subsampling MCMC literature. 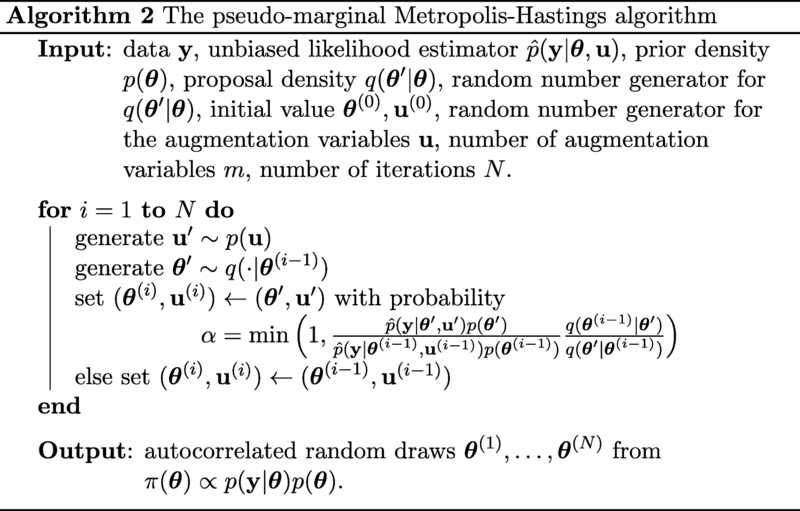 Pseudo-Marginal MCMC Difference estimator Hamiltonian Monte Carlo (HMC). Matias Quiroz and Robert Kohn were partially supported by Australian Research Council Center of Excellence grant CE140100049. 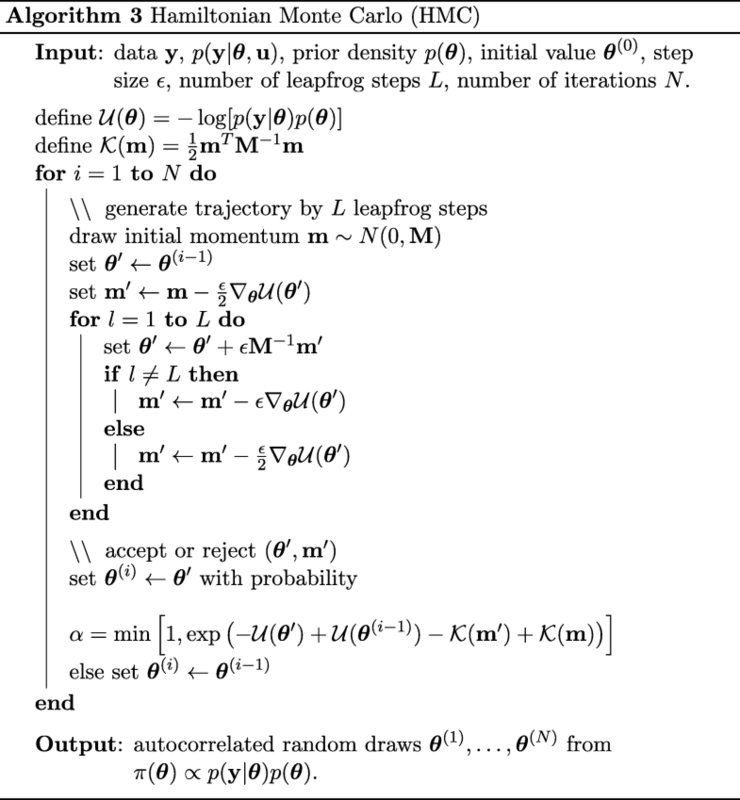 This appendix contains the main sampling algorithms discussed in the paper. This appendix gives the details for the control variates in our illustrative Poisson regression example. Quiroz et al. 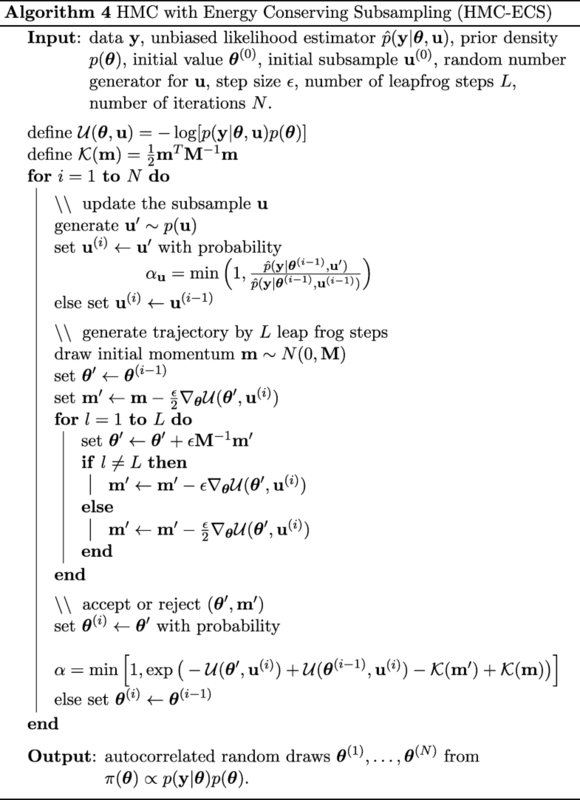 (2018a) give general expressions for the gradients and hessians in the GLM class, and provide general compact expression that reduces the computational complexity of the control variates. where 𝜃 = (α, β)T.
Betancourt, M. (2017). A conceptual introduction to Hamiltonian Monte Carlo. arXiv:1701.02434. Dang, K.-D., Quiroz, M., Kohn, R., Tran, M.-N. and Villani, M. (2017). 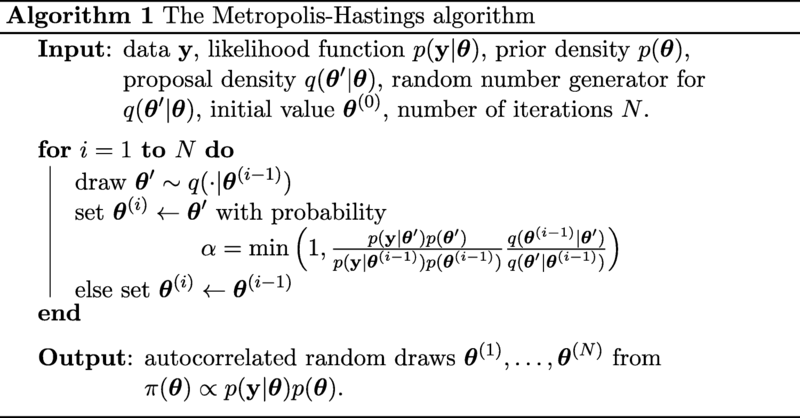 Hamiltonian Monte Carlo with energy conserving subsampling. arXiv:1708.00955. Gelman, A., Vehtari, A., Jylänki, P., Sivula, T., Tran, D., Sahai, S., Blomstedt, P., Cunningham, J.P., Schiminovich, D. and Robert, C. (2017). 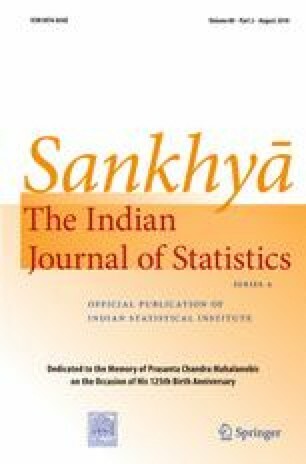 Expectation Propagation as a way of life: A framework for Bayesian inference on partitioned data. arXiv:1412.4869. Gunawan, D., Kohn, R., Quiroz, M., Dang, K.-D. and Tran, M.-N. (2018). Subsampling sequential Monte Carlo for static Bayesian models. arXiv:1805.03317. Neiswanger, W., Wang, C. and Xing, E. (2013). Asymptotically exact, embarrassingly parallel MCMC. arXiv:1311.4780. Nicholls, G.K., Fox, C. and Watt, A.M. (2012). Coupled MCMC with a randomized acceptance probability. arXiv:1205.6857. Papaspiliopoulos, O. (2009). A methodological framework for Monte Carlo probabilistic inference for diffusion processes. Manuscript. Available at http://wrap.warwick.ac.uk/35220/1/WRAP_Papaspiliopoulos_09-31w.pdf. Quiroz, M., Tran, M.-N., Villani, M., Kohn, R. and Dang, K.-D. (2018c). The block-Poisson estimator for optimally tuned exact Subsampling MCMC. arXiv:1603.08232. Quiroz, M., Villani, M. and Kohn, R. (2014). Speeding up MCMC by efficient data subsampling. arXiv:1603.08232v1. Wang, X. and Dunson, D.B. (2014). Parallel MCMC via Weierstrass sampler. arXiv:1312.4605v2.